NOAA is descended from the oldest physical science agencies in the United States Federal Government including the Coast Survey (1807), Weather Service (1870) and Fish Commission (1871) … the NOAA collection includes thousands of weather and space images, hundreds of images of our shores and coastal seas, and thousands of marine species images ranging from the great whales to the most minute plankton. 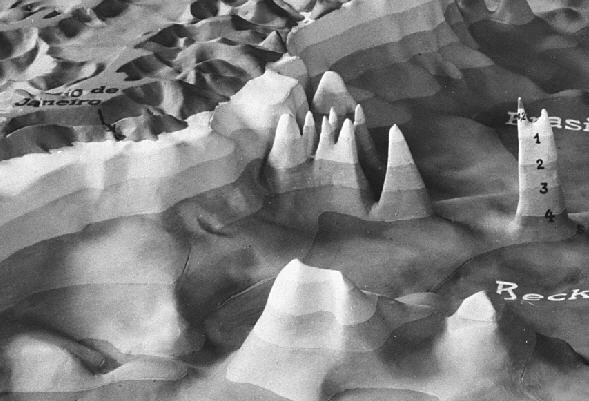 While looking through their catalog of images I came across this very cool 3D rendering of bathymetric data from the late 1920s. Click on the image to go to the NOAA Photo Library page for this image (or click here for the full resolution version). This 3-D view of the equatorial Atlantic seafloor was produced following the German METEOR Expedition of 1925-1927. The Mid-Atlantic Ridge snakes down the middle of the Atlantic Ocean between Brazil on the left and Africa on the right. Although the resolution of the data isn’t very good, the detail of the image itself is exquisite. Below is a zoomed in part of the image. I highly recommend checking out NOAA’s site … lots of great stuff. Brian, do you think the spire-like formations are ordinary seamounts and such? Could they have actually recorded white or black smokers along the spreading center? SF … that’s a great question … I guess one could compare this data with more current. Since they were getting bathymetry from the sea surface and not sampling the sea floor (as far as I know) they probably didn’t have any direct data of what the sea-floor features were. But, they probably hypothesized and speculated in their writings … would be interesting to read that.